Paul McCartney is going to release a new 7" Christmas single on green and red vinyl. A couple of copies have already been sold over at ebay, although the release date is December 3d (4th in the USA). The song is of course the old chestnut "The Christmas Song", which is on side A of the single. 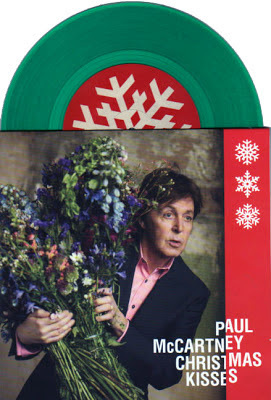 The song on the flipside is McCartney's 1979 Christmas hit single "Wonderful Christmastime", as interpreted by the band "The Shins". Both tracks have been taken from the new Hear Music Christmas album Holidays Rule . The new single is released by Universal and has the catalogue number 7234232. Any word if it's going to be made available to the public, or is this a special release?